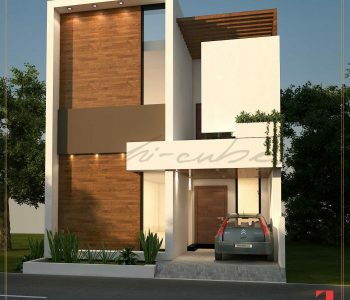 With contemporary style but with the use of earthy materials at the same time, this, user as well as environmental friendly residence is designed by best interior designers from Archi-cubes, finest Architectural firm in town. The back-and-forth use of the design elements in the exterior is depicting minimalistic approach towards users. The vertical and horizontal elements breaking the monotony and creating somewhat interesting and creative outlook keeping the simplicity constant throughout. The use of different materials and their interplay let others get fascinated more and more. 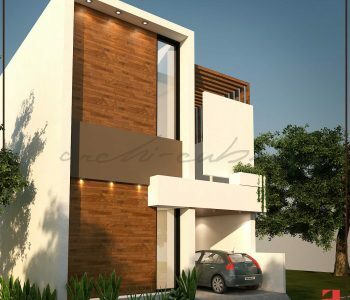 It is also not hard to notice the play with natural materials in façade of the structure. The volumes of the spaces are enhanced by the way greenery is used. The amazing way of materials is practiced quite thoughtfully which are getting attraction and attributes of sophistication in the whole structure. Colors have always been a challenging task for Interior designers and Architects. Though this task is always managed wisely by the designers of this firm in a way that they have always succeeded to maintain minimalism experience for public. And eventually one would always look up for their signature styles. However, the use of earthy colors in which green is displaying more richness with the other two, is somehow more fun to understand, giving the feeling of freshness and productivity. The elegant architecture is maintained not only in exterior but in interior too, with the perfect use of theme and philosophy. The richness of using both modern and traditional look in the façade by using glass and wood, in such a way that one wouldn’t help but engrossed in this perfect mystery. Moreover, the play with light and shadows by using pergolas and volumes creating detailed and enhancing features. Viewing all this, one can analyze the depth and meaning of the details and look up the elements providing grandeur as well as descent outlook. This helps one identify philosophy in a right way by viewing such different features and contrasts.